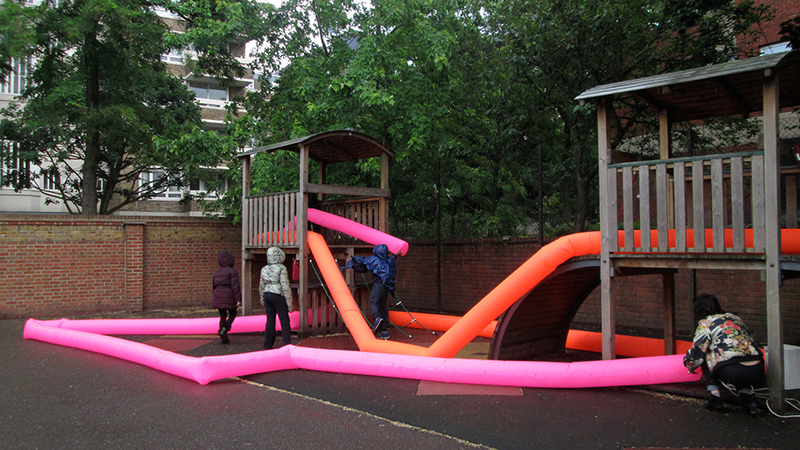 Whether you are young or old Rachel believes that the inflatable medium can offer learners the capacity to create metamorphic, large or small scale structures be it sculptural objects, installations, design solutions, for wearability or play. This lightweight medium can offer learners boundless opportunities to learn and create. 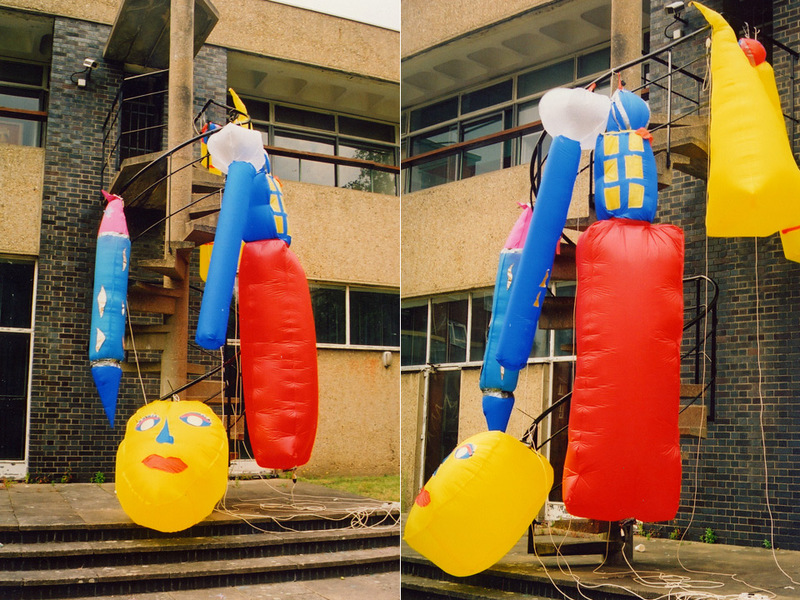 Are inflatables underused in art and design education? Yes until now…! This selection of work shows our work with early years, schools, summer schools, through to Foundation Art and Design students. Introduce learners to the inflatable medium by teaching simple construction techniques of turning 2D ideas into 3D work. Enable learners to make large scale pieces. Span knowledge taken from cross curriculum subjects such as mathematics and science. Engage with how learners can take ownership of their artwork, by what they do and how they present it. Consultations with local residents highlighted the need for engagement between the artists participating in the annual street party and the local community. Arts Council funding was sought and awarded to St Luke's Community Centre to commission 5 artists to take residence in the street before the annual White Cross Street Party. This enabled the local community to observe the artists' process and if they wanted to participate in it. Rachel was assisted by Margaret Jennings while resident on the street where they invited audience interaction with the components of the proposed installationBy opening an interactive exhibition - Look, Touch and Change. Here visitors were able to interact with the tubes and play with configurations. At St Luke's Primary School Rachel and Margaret facilitated two educational workshops about Street Art where pupils designed and created artistic interventions in the playground. At the event Rachel's installation used the facade of the YMCA building, here young YMCA members assisted in the install. This engaged over 90 local residents in the development of this work. Since Rachel's arrival in November at St Luke's Community Centre as Artist in residence she has worked with local community members both here, White Cross Street and at St Luke's School. In May she worked with St Luke's over 55 groups to create a large inflatable lamp exhibited at Cubitts Summer Ball and at Fizz Fest. Here members collaborated on a collaged piece to show what St Luke's Community Centre means to them. The large inflated piece illustrates the thoughts, ideas and interests of the members of the centre. Initially working with the Arts and Crafts group, then with additional contributions from members of the club room, the men's shed, the cookery school, and the life drawing group, this coming together of exceptional work tells a story of the vibrant life at the centre and its relationship to its members. In contrast to the South Devon College project this work was with Students mid way through their Foundation Art and Design course who had already decided on their area of proposed study for degree level courses so the course consisted of Fine Art, Design, fashion and textiles students. This also was produced with no materials budget where students were responsible for their own materials. Rachel was also very conscious that students at this point were already on a journey with their ideas and concerns and offered here a very experimental course to learn about inflatables. In order to experience its unique qualities. Her intension for the 4 day workshop being that the students were to experience the qualities of the inflatable medium rather than get bogged down in the complexities of construction by developing lo tech methods of working simple forms, this encouragingly resulted in a very assorted response. However the overriding quality exposed by inflatables' transformational qualities was its ability to invite human interaction. 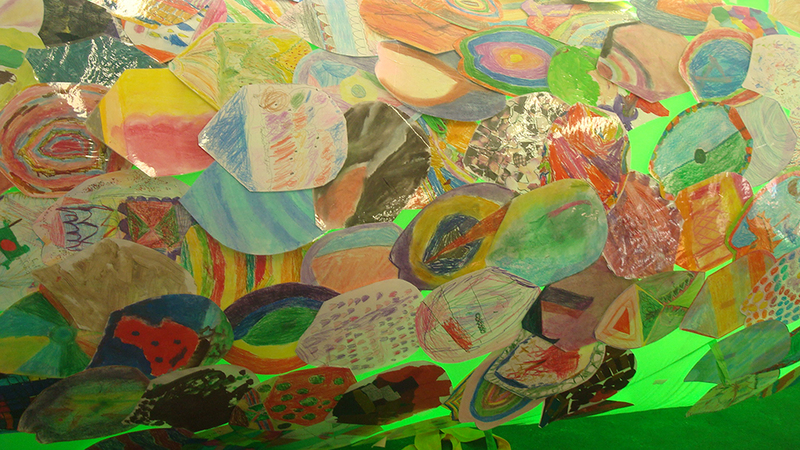 During the school's Science Week in March 2015 Rachel collaborated with Gayhurst to design a project that introduced the concept of cells and inflatable design to year 3 pupils.Groups of six children explored the patterns and shapes found in cells and worked to produce a 3D form from collage, drawing and simple construction. They learnt how constant air pressure maintains an inflatable. The results can be seen in the photographs of team work, new understanding of scientific concepts and simple construction techniques to produce inflatable sculptures. This involved the whole school on a large scale collaborative piece during their Science Week, here we used our old friend the snake.We engaged all ages from nursery to year 6, to learn about the function of scales, their shapes colours and the reptiles, fish and animals that wear them. This work was accompanied by real life reptiles that came to visit the children at the school. Each child designed a scale which was laminated and attached to the snake. This resulted in a new skin for the snake where children learnt through art practice and experienced a collaborative exhibition. Here children in Queensbridge School and De Beauvoir School in Hackney created inflatable jellyfish and squid as part of a project organised by Pinksie, where 24 artists from various disciplines worked in three Hackney schools to promote in each a week of creativity. The children were inspired by the book 'Pinksie the Whale and the Deep Blue Sea' which is a story that celebrates difference. Represented through a story where Pinksie the Whale discovers all kinds of strange creatures from the deep sea. Artists took this inspiration as a starting point from which to initiate creative workshops. The children’s' imaginative work was exhibited at the Rose Lipman Building, Hackney. The art work was put on sale to raise money for Great Ormond Street Hospital. The children created their inflatable creatures through group collaboration, the sharing of ideas through drawings and working together to decorate and construct their work. 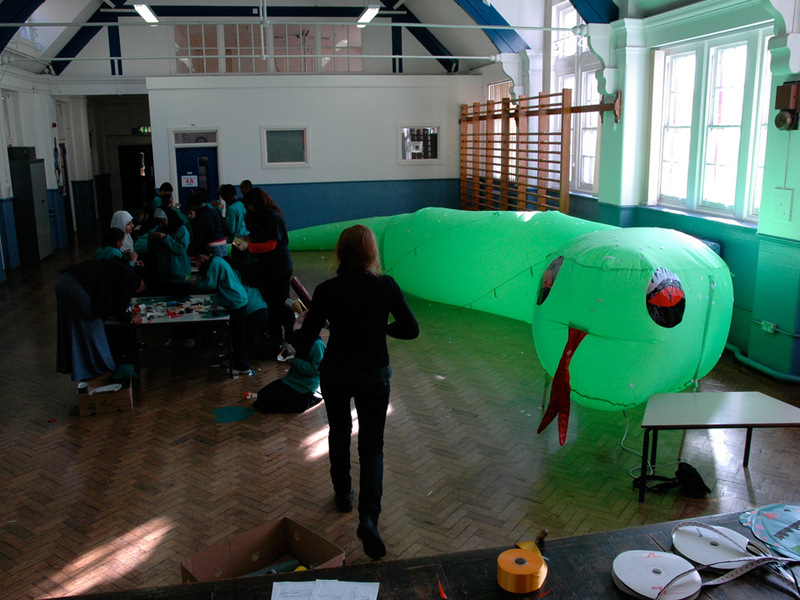 'Continuity' was a 5 day workshop that Rachel taught as an introduction to inflatable sculpture. The workshop was held at South Devon College for Foundation Art and Design students. 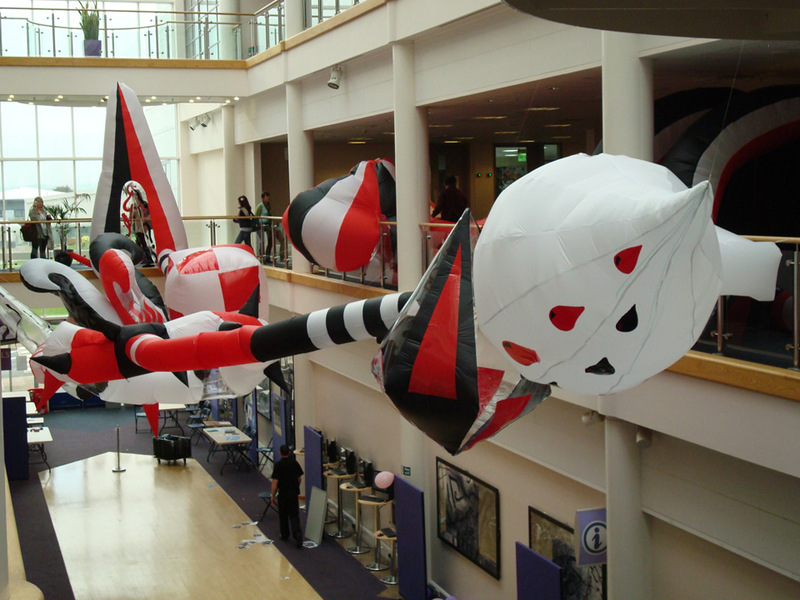 The students worked in groups of three or four to design and make an inflatable sculpture that would have a tube in and a tube out in order to join to the next groups piece each to create one giant sculpture that was exhibited in the gallery and atrium of the college building. Students worked on drawings, models and in Form Z in order to learn how to construct 2D ideas into 3D pieces; the results were stunning! Originally seen at Somerset House's Free Time children's event, this giant serpent attracted children from very young to teenage to create a scale for the serpent. Where for the finale of the day this large creature came to life to lead a parade of its young artists around the main courtyard. This serpent was stripped and reworked by children on a school project held in Enfield for a Saint Patricks Day Parade, this time the scales took the form of shamrocks where the children decorated the leaves with inspiration drawn from the story of St Patrick. See below the children working on the project and performing in the parade. Rachel James worked in collaboration with Lucy Hubbard to create a winning proposal for an outreach project funded by the Scottish Arts Council aimed at children living in remote areas. The project managed by An Llantair Arts centre asked that we work with 3 groups of children aged between 4-6, 7-10,11-16 in two villages on the island over two weeks each staging an exhibition on the Friday of each week the exhibition was open to the public. 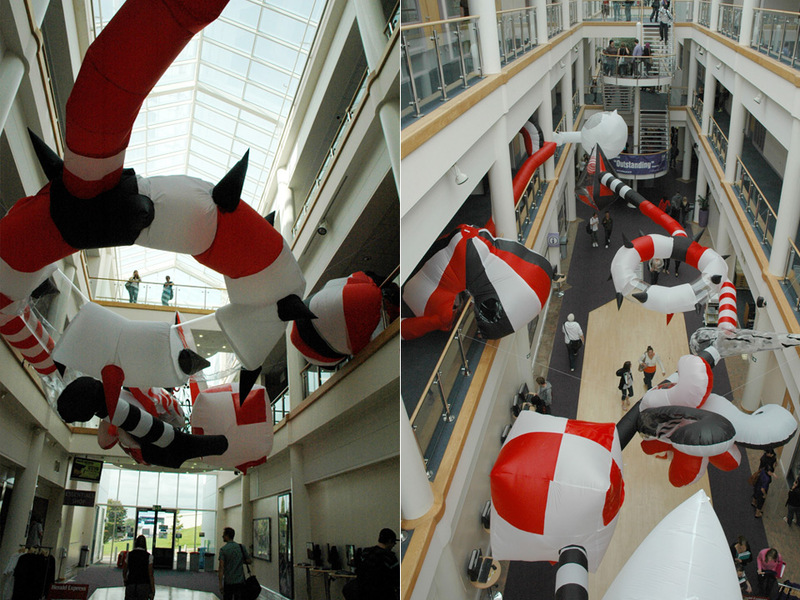 The project worked with internal and external space to create an installation piece. 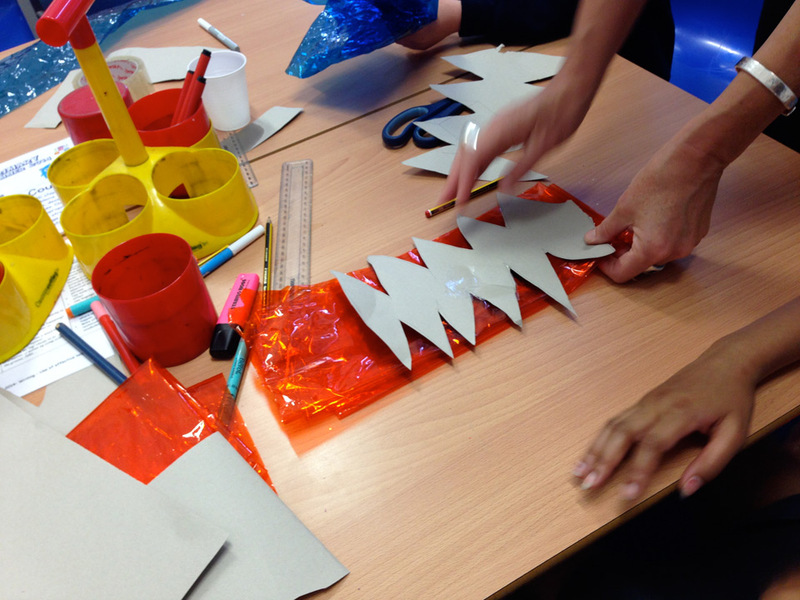 The early years group worked on the external space area which would lead viewers into the children's installation using paper to create light pods. The second group worked on the transformation area which consisted of three cylinders in transparent PVC. The third group worked on the internal space which involved entering the tent to view. Members each designed a personalised emblem or tag to decorate the inside; by forming multiples patterns were formed and each child stitched a panel to the next to create an inflatable tent. All of the children took inspiration from their interests, identities and surroundings to create their art work as well as gaining understanding into how 3d work is constructed from 2d forms and how inflatable forms can be simply made. This 5 day course was held with children aged between 12-14 with children creating models and taking inspiration from artists work. Making simple shapes and projecting patterns to create work installed in the school grounds. The week was spent exploring and learning about inflatables how they are used in many areas of work. On the final afternoon Children sent messages on postcards attached to helium balloons about their week and what they learnt.